Have you experienced first-hand the personal frustrations of choosing between your career in financial services and being the type of parent you want to be? Or are you looking for an alternative to the commute? 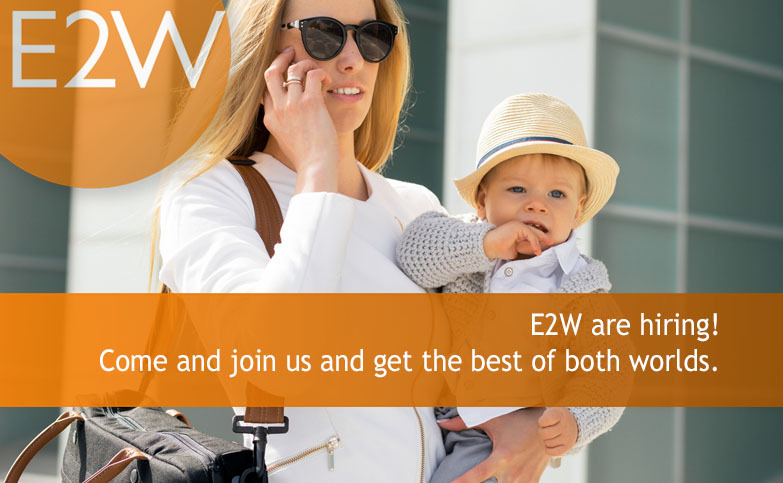 E2W have a solution that removes some of the barriers and challenges of a ‘city’ career. We offer exciting and interesting work that draws on your experience in the industry. We offer flexible and agile working, with a family-friendly ethos, in an office environment close to your home in Kent. Since 2002, E2W have supported women in their financial services careers and enabled Financial Institutions to gain the benefits of a more diverse workforce. Today we boast a community of over 10,000 women working in investment banking / asset management and for large international banks in London. We are also working with a number of financial institutions who are great places for women to pursue their careers. Our recruitment team that supports this side of the business is growing and needs your help and support! An increasing number of our clients are outsourcing projects and ‘business as usual’ activity for us to deliver. Our team that looks after a major institution who has entrusted an element of their regulatory process, needs your help and support! If you have recent or past experience of working in financial services we would love to hear from you.